Have you ever caught yourself comparing yourself to others? and I can’t remember the other one. the house they lived in… the list could go on and on. But after I met Jesus, when I was 21 years old, and I turned my life over to Him, the Lord started working in my heart about many things, including this one. I also started listening to a lot of Joyce Meyer’s teaching, and that helped too. Papa started showing me that I’m NOT those people, and He didn’t call me to be those people. He called me to be myself. This is awesome advice, and it really helped me kick that comparison problem to the curb. Think about it. As Christ-followers, we have a race to run here on earth. We will be running that race for the rest of our lives. But we each have our own lane! God has an individual plan for you and for me. His plan for you is different from His plan for me. I would make a terrible you, and you would make a terrible me! I am myself, and you are yourself! We are unique individuals. I love listening to Bishop T.D. Jakes preach. That man could preach about macaroni and cheese, and it would be anointed. My friend Dawn is a natural-born evangelist. She could walk up to anybody and ask them if they know Jesus (and she does). It’s unreal. But I can’t run in their lanes. I can’t be Theresa. I can’t be my pastor’s wife. I can’t be Bishop T.D. Jakes. I can’t be Dawn. But, I CAN be the best Jamie Rohrbaugh you’ve ever seen in your life! And I will be! How? By running in my own lane. By pursuing the gifts, skills, callings, people, and tasks God has assigned to me. You can’t be someone else either. However… you can be the best you that there’s ever been if you will run in your OWN lane! God thinks thoughts about YOU. Not just generic thoughts about people in general. God has plans for YOU. God’s plans for you are unique, different, and special. Nobody else could ever fulfill them. Your destiny is yours, and yours alone. You can’t be someone else; you would make a terrible “them.” But you can be an awesome you! So run in your own lane. Run the race God has for you. Be the best you you can be. 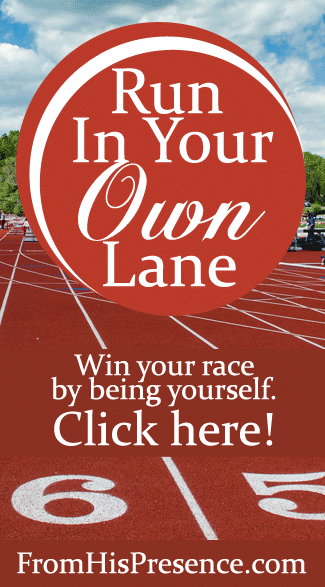 Do you need to stop comparing yourself to others, and start running in your own lane? If so, please share your thoughts below in the comments. Thanks! Image courtesy of Bob Mical on Flickr via Creative Commons license. This is a “right now” kind of post for a lot of people including myself. Great work!